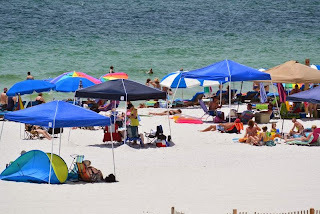 This beachfront Gulf Shores vacation rental by owner is located at Clearwater Condos on the Alabama Gulf Coast. This one-bedroom home is tastefully decorated with tropical decor and has a gulf-front pool to enjoy the mild Gulf Shores weather. This unit is on the third floor of this low density condominium complex, the property has been remodeled with all-tile, new kitchen/bath cabinets, granite counter-tops, large-screen HDTV and free Wi-Fi internet - plus a Bluetooth Player for your iPod/iPhone or Android mobile device is available for your use. The bedroom has tile floors with a yellow and white striped accent wall combined with white on the other walls. There is a king white cottage style bed with fun floral bedding, plus a nightstand on each side, with a green lamp. There is also a chest of drawers and a TV. The bath has a tile floor and aqua walls, with a shower/tub combination, white cabinets and a white square sink. The hall includes built-in bunk beds with a white frame--kid size for both beds, with a beach theme mural down the wall to provide the perfect ambiance. The kitchen has tile floors and green walls, with granite counter-tops, white cabinets and white appliances. There are two stools at the kitchen bar. In the dining area, green walls and a white wood and glass table with four chairs. The green walls continue in the den, surrounding a blue suede chair and a brightly patterned sofa, plus a red leather ottoman. There is a white wicker table with a lamp and a cute painted table with a lamp, as well as a coffee table and a flat screen HDTV and a DVD player. Plan your beach escape in this Gulf Shores vacation rental on the Alabama Gulf Coast, enjoy huge, white beaches with small-town charm, fresh seafood, and an outdoor coastal lifestyle enjoyed by many.